I played for the club hockey team while I was in college. That was a long time ago. And both women’s hockey and I have grown up substantially. While I was playing there, anyone who wanted to play could. I had teammates who had grown up playing on boys teams, I had teammates that had never skated (nor seen the game) who joined us, and we had one player who had been a man a few years earlier. She was big and strong and had a quiet demeanor. Until you got her on the ice. Then she was big and strong and had a slap shot that you never, ever, tried to block. Sorry, goalie, that one’s on you. But that was over 20 years ago and fortunately things have changed. Especially for our friends who are transgender. When I heard about this book, I knew I had to read it. I had to see how things have changed, how I have changed since that time. 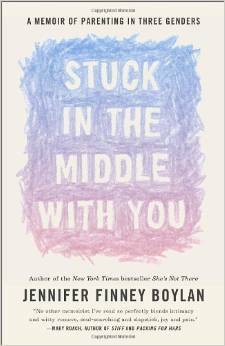 In Stuck in the Middle with You, Jennifer Boylan tells the story of her transition from a man to a woman, but more specifically from a father to a mother. Jennifer’s writing is approachable and honest. The story flowed beautifully, as did her transition to a woman. Mixed into the memoir, she also included interviews with other writers, mothers and colleagues. At first I found these disruptive to the linear flow of the book, but as her story progressed they were a welcome interruption to the heavy topics. It also introduced another person’s perspective, which is hard to do in a memoir. Because the story is the writers, and the writer can’t place themselves in someone else’s head, the interviews showed other sides of the story. I have to admit I read this book months ago. I’ve forgotten a lot of the details, but I know that it has stuck with me, she has stuck with me. Read this book. If for no other reason than to peek into the house of a family of four that love each other unconditionally. And know that you’ll learn something about taking risks and following your heart. Looking back at my college days, with my trans teammate, I only wish I could have been as accepting and tolerant as Jennifer and her network are. And I hope that my former teammate has found her own place in the world, as a tall, strong, sometimes quiet, woman with a hell of a slap shot.